Fruit of our land and of the people who love it so much, our wines are still produced following the old family secrets, so as to enhance the most of the qualities. Whether for a simple tasting or to accompany your meal, our 7 typicality will engage you in an embrace of taste and tradition that will warm your heart and tickle your taste. Deep ruby red color, the nose will immediately perceive its characteristic herbaceous scent, to follow, the nose is filled with aromas of cherry, red pepper and sweet spices. To the palate turn out to be a wine full of personality, where we found pronounced notes of ripe red fruit. The end is a spicy aftertaste that gives complexity to the wine. The ideal match is with first courses (meat sauce), red meats, and medium-aged cheese. The color is a beautiful yellow with greenish reflections, the smell will capture you immediately by well-defined notes of tilia flowers, dandelion, honey and citrus. To the palate you can feel a great intensity and with a pleasant smoothness that invites you to drink again. It is a wine for every meal, except for the rare meat and the game meat sauces. Excellent as an aperitif. 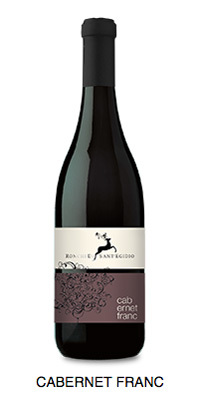 Ruby red color with violet shades, the nose will perceive aromas of wild blackberry, red berries and blueberries. To the palate, thanks to the refinement of a small percentage of wine in barriques of second passage, you can discover a pleasantly smooth wine, accompanied by spicy notes. The matching is easy, thankfully to the elegance of this wine. Ideal for fatty plates such as meat platters, excellent with soups, minstrone soups, main courses like roasts or grilled. The color is a pale yellow with greenish reflections. It should be drinked young to fully appreciate the fruity scents. The taste is very fresh and pleasant. Excellent as an aperitif, also ideal to accompany appetizers, delicate firs courses risotto. Ruby red color with violet reflections, which are reduced with refinement. 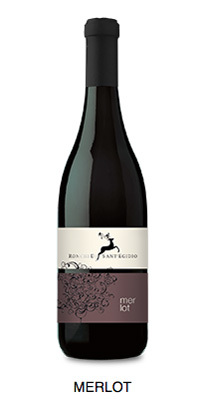 It’s a wine with an intense aroma reminiscent of wild blackberries, wild berries and cherry. A strong taste of ripe fruit that blended with the tannic taste gives to the wine a great elegance. Ideal pairing with meats in general. The color is a beautiful straw yellow, to the nose results beautiful and expressive, you can be perceive intense notes of green pepper, mint, white peach and elderflower. The taste will reflect all the nuances previously received to the nose, resulting aromatic, smooth and refreshing. 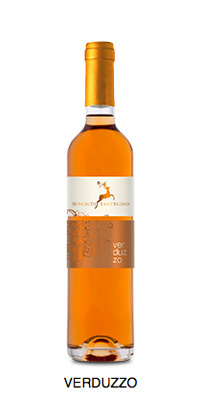 The color is a beautiful golden yellow, it is a very intense wine, but never cloying in which you can discover notes of honey, ripe fruits like apples, apricots and pears. It’s ideal to pair with pastries, desserts and particularly spicy cheese or soft cheese.